It’s the last day of lobster season and Gary’s birthday. It’s funny how things work out so perfectly sometimes. To celebrate, Kris and I went out on a dingy adventure with Gary to some shallow waters nearby. 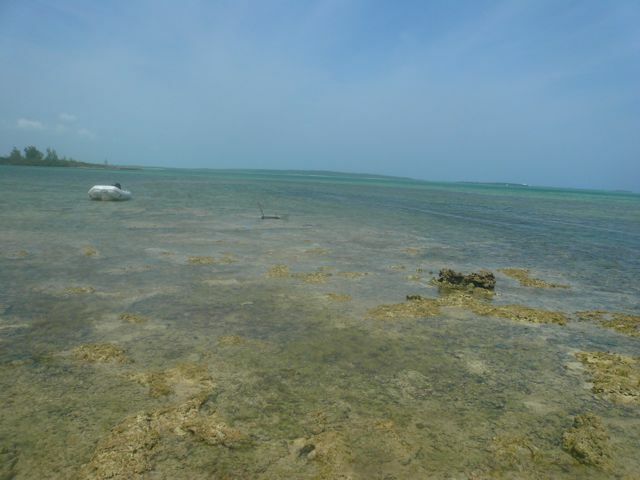 We were prepared for conch and possible lobstering with the snorkel gear, lobster spear, and hatchet. None of us expected too much, perhaps just a few conch, but the sun was shining and the water was clear and colorful. It was a beautiful day. While scouring the rocks for conch, Kris discovered lobster antennae poking out from underneath an overhang. Gary immediate began trying to catch them with his bare hands, with no success. He and Kris let the waters still and the lobster calm down and went to fetch the lobstering gear. Gary then proceeded to lobster to his heart’s content. 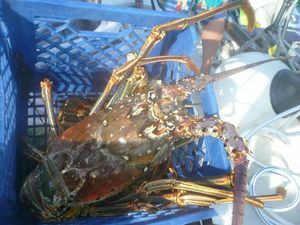 He caught a nicely sized lobster near where we had first spotted them. The caught a second one in the same spot, but not without a struggle. Gary got his arm stuck in the rock opening, and the tide was rising. Quick thinking and resourcefulness in his and Kris’ part saved Gary. He and Kris chiseled the rock from under Gary’s arm using a metal poll found in the rocks and the hatchet as a hammer. I kept watch over the situation, trying not to think of the famous Aaron Lee Ralston who had to amputate his hand to free himself from a fallen boulder. Luckily Gary had Kris and I with him, soft coral rock, and sharp minds. Ahab has speared the great red lobster! This is lobster #2. After the unnerving experience, Gary went right back to enjoying his birthday. He caught more lobster. The third of the day was a huge monster, the largest we had seen yet. He was about 2ft in length, not including the antennae. I saw him swim right by my head while I was snorkeling in the shallow channel. He was amazingly graceful and fast, but not fast enough. Gary had speared him in the side and he came shooting out of his protected hole. The injury slowed him down, and Gary was able to capture him. 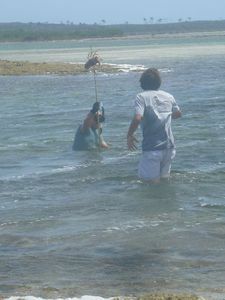 Kris and I enjoyed a nice swim in the small channel while Gary hunted lobster. There was a wide array of tiny tropical fish,colorful corals and anemones, sea slugs, sea cucumbers, and a larger pink colored “ghost fish”, whose large black eyes warranted his nick name. There were sea urchins as well, lurking under the rocks, so we stayed wary of our surroundings. The catch at the end of the day totaled thus: 4 lobster (more like 5 with the giant monster), and 9 good sized conch. We will be feasting on sea food for many days! It was a superb end to the lobster season, and a wonderful birthday for Gary. Who could have asked for more? Beautiful snorkeling, good conching, an epic lobster hunt, and small battle for survival. All in all, a good day I’d say. It’s a shark, a dolphin….or Gary’s flipper? Lobster #2 stares up at me. Gary’s two largest lobster, and a large birthday grin. Now that was a crazy, harrowing story – could it be that the big guy was holding onto Gary’s arm under that rock? No, the lobster had escaped. 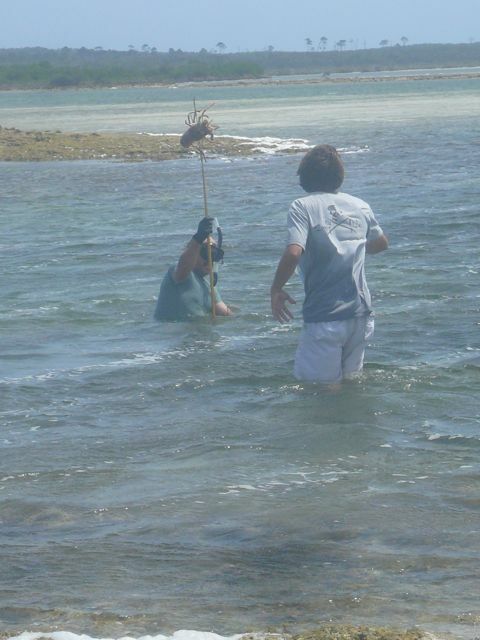 The spiny lobsters here don’t have claws, and so they cannot really hold onto you. However, he was so difficult to get out because the spines all over his body are curved forward, so the spines lock into the rock and make him more difficult to remove. Also, Gary learned later that he probably should not have been reaching into the holes. Moray eels live in some of these holes and it one of those gets a hold of your hand, you might as well kiss that hand goodbye!